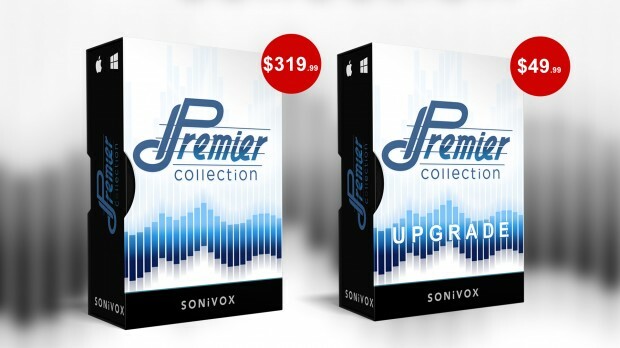 SONiVOX announce the release of their “Premier Collection”. To celebrate this release, if you own any SONiVOX virtual instrument, you can upgrade for only $49.99! If you are a composer / producer this collection from SONiVOX is the one to have. It contains a wide range of essential instruments that will feed your creativity and other more exotic ones that that provide fresh new colours and timbres to inspire you. Premier Collection by Sonivox is for you. This collection of 19 instruments has it all… Every Orchestral instrument you can imagine, vibrant, lifelike piano, the full spectrum of dynamic percussion sounds, Hip Hop stylings and every electronic effect there is, including all the synth, grunge and grime you’ll ever need. It’s all here, perfectly organized, easy to use and ready to go. This entry was posted in DontCrack, Plug-ins, Promotions and tagged Big Bang Cinematic Percussion, Big Bang Universal Drums, Blue Jay Drums, Bright Electric Guitar, Classic Bass, Eighty Eight Ensemble, FM Piano, Harmonica, Harpsichord, Orchestral Companion - Brass, Orchestral Companion - Strings, Orchestral Companion - Woodwinds, Premier Collection, Premier Collection Upgrade, Session Drums 1, Silk Road Percussion, SONiVOX, Taylor Acoustic Guitar, TimewARP 2600, Twist, Wobble. Bookmark the permalink.